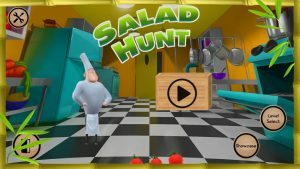 Salad Hunt : A family friendly FPS with cartoony weapons and destructible environments. Arcade rail-shooter gameplay in a simplified mobile format. You are The Chef and you discover that salad ingredients have come alive as cute, but mischievous characters that are ruining your kitchen! Toss whatever you can find at them to save what remains of the kitchen, or just destroy everything in the process. Bonus levels: Swipe up to flip the table! Been playing the demo version a while back and it was a lot of fun. Mindlessly blasting away those kitchen critters. It’s the best way to spend 10 minutes while waiting for the bus after work, while working up an appetite. The new levels are tons of fun!! A fun madcap of violence and adorable animated vegetables. Not a lot of thinking and a great little stress reliever. It’s nice to see a game that you can pick up, put down, and come back to later without losing interest. So cute!!! I love this game. I feel like kind of a monster for killing the tomatoes though, so maybe you could make them meaner. Discovering this game at PAX East was very exciting!